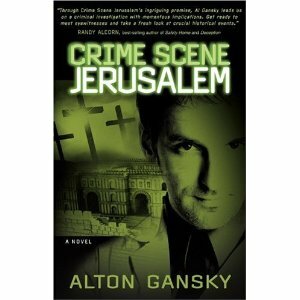 Crime Scene Jerusalem: A Novel by Alton Gansky (published by David C. Cook, 2007) does a masterful job of pulling off a peculiar premise: Max Odom, a forensics expert, is taken back in time to investigate the crucifixion and resurrection of Jesus Christ. Gansky makes the story much more than believable– he makes it gut-wrenching. The forensics expert doesn’t want to be there, and expresses all of the sarcastic humor of a jaded American man. But when he comes face-to-face with the cross, and sees how Jesus’ death speaks to the pain in his own life, he… well, read the book yourself. You will not be able to put it down, and you’ll be changed by the experience. Gansky describes life and culture in first-century Jerusalem vividly, and Gansky keeps the reader guessing what hurt Max Odom experienced that must come to the surface as he witnesses the Passion of Christ. A fascinating read for the Easter season or any season. Posted on March 14, 2013, in Apologetics, Books and tagged book, books, Christ, cross, faith, Jerusalem, Jesus, mystery, religion, resurrection. Bookmark the permalink. Leave a comment.